HomeChildren's MinistryChildren's Pastor (not family pastor) at Heart! To become a Family Minister or to not become a Family Minister? That is the question. Well, for some it is. For me it’s not. This is one of my rants, but before I begin, let me say that I love family ministry. It’s great! Will our church ever have a family minister? I don’t think we will. Is it because we’re against family ministry or do not support family ministry? Absolutely not. It’s because, for one, I’m a children’s pastor. I don’t want to be a family minister. I value the family. We give amazing tools for families to connect. We encourage parents to disciple their kids and give them tools to do so. We do tons of events that promote family values and bring everyone together. But, will I or anyone else ever be a family minister? I guess we do the work of a family minister, but nope—I’m a kids pastor. I’m called to pastor children. My main role is to shepherd children. I love shepherding them. I love creating an environment where they can be in the presence of God and take what they’ve learned to impact their friends and family. I think some leaders are made to feel guilty because they’re not doing “family ministry”—whatever that looks like? In fact, I’m still searching for a church out their where church is just a secondary place where kids get discipled because their parents are doing it all at home. If you’re out there…show me some love—I want to hear about you and what you’re doing! The reality is that I do all I know how and more (because I’ve read the books) to assist the family. But, at the end of the day I’m proud to be a children’s pastor pasturing children. I guess this isn’t that much of a rant. It’s more of a showing the love to those who feel called and satisfied in that calling to be a children’s pastor. Right on. Well said, Justyn. I respect you opinion but totally disagree. In all the years I have done kids ministry focused on kids alone I made an impact on a few for sure but I have come to realize the biggest problems kids face are typically at home. I believe that long term growth and health it a kids life takes place when we stop trying to be the spiritual expert who parents bring their kids to so they can get set straight and we instead become the partner in the life of a family to equip parents to be that spiritual expert in their kids life. Families are more mobile then ever. Our influence is temporary. We need to leverage our influence to help parents become what God intend them to be the primary influencers of a child’s spiritual journey. So even though my business card says I am the children’s pastor at my church I am really a family pastor at heart. Maybe I can expound on my post a little. I see two types of families coming to my church. One type of family has a mom and dad (or whatever) who love God and desire to lead their children in the ways of God. That type of family is looking for a partner, a church that will give them the tools to be the spriitual experts in their kids’ lives. For those families, we need family ministry. We need a church that fills those needs. That’s why our church sends home packets every week with review questions and activities for families to do together. But I see another type of family coming to my church; a family whose mom and dad (or whoever) do not, or can not, or will not be the spiritual leaders of their children. Many of those parents don’t even want to shepherd their children. They are looking for a church they can bring their kids to and, as you said, get set straight. They want the church to be the spiritual leader and teacher for their children. Those families need two things. One, they need someone to impact the parents, hopefully to get them to change their thinking and begin to desire to lead their kids. Two, until the parent’s change, they need a place where they can drop off their kids to get some God. So I feel that churches need both, they need ministry to parents/families and they need ministry to children. The question is, what role does the children’s pastor play? Does he/she minister to just the kids or does he/she take on the role of teaching/mentoring parents, too. In my church I think my lead pastor is much more effective at reaching those parents who are not leading their kids because he has their ear every Sunday (or whenever they come). I only see those parents for a few minutes at pick up and drop off. I can send materials home with them or offer parentlng classes or online videos but the’ll only participate once they’ve been inspired by my lead pastor to do so. I’ve also found that when I offer those tools, the parents who take advantage of them are the ones who already are leading their kids at home. If that’s the case, how effective am I being? How do you measure the effectiveness of familiy ministry? Maybe the dynamic of your church is different and you’re able to reach those parents in a way I can’t. I resonate with what you are saying. I did my DMin dissertation on family ministry. I do not pretend to be one. Nor do I wish to be one, as I have explained to the leadership at my church. However, I do attempt to connect with parents intentionally. One way I do this is through parent coaching. I base it loosely on Karl Bastian’s concept of negotiated partnerships with parents. He has a resource at kidology.org called Learning Lab 4, Partnering with Parents. I highly recommend it. 1. I am also a pastor to families and help to serve them. 2. If I want to be in ministry to youth long term, a family pastor is an option I have to entertain. Youth Pastors (and Kid Pastors) have a certain salary range that cannot (or hasn’t yet) been topped. Therefore, unless I work at a mega-church (which I don’t), I have to look at working with children too and become a Family Pastor. That way I can make a little bit more money and allow my wife to stay home with my 4 daughters. Justyn, good post and I see your heart for serving kids come through in that post. I am a family pastor…we are striving to partner with families every week. You are serving and partnering with families as you give them tools to use at home. The role of family pastor has to be someone who has a specialty in one area (preschool, college, kids, teens) BUT someone who is ready work with all the other area’s of preschool-college ministry also. There are some weeks I focus on preschool and some student ministry, YOU NEVER KNOW! My role is to help our team move as ONE united as we create amazing environments for kids and parents. You never know…God may use you in the role down the road to lead a team. Screw titles…you are serving families. Thanks for your passion! Thanks man. I looked you up at your church. What’s your role like? I saw that you have a children’s, youth and college pastor. I know that these other guys help focus on building families, so how does your role work exactly? Are you behind the scenes? Also, I think a little of my frustration is that children’s pastors are feeling pressured to become family pastors and it seems like that is something different than family pastoring. Though, I agree when you impact kids you impact families. I love your “screw titles” comment. I agree. I am a children’s pastor who does a great job at serving families (if I do say so myself)! I agree…there is no use in getting caught up on running to this new title. we serve teens and kids because we are gifted and called to work with kids and teens. That is what we do and who we are. I have a great job. I am very hands on with student ministry and I support from behind the scenes with kids, college and preschool. I get to work to find resources and push forward the dreams of the other pastors I work with. Sunday I am speaking in our 4th-5th grade environment, I am pumped. I lead the family ministry TEAM and each of us have our direct passion for certain age groups. We all work together, pastor teens kids and college students, and fight hard to partner with families. Let me be clear. I think we are saying mostly the same thing. I think we would all agree that in ministering to kids we can’t do it in a vacuum that we must take the family aspect of a kid life into consideration. When I first started working at my church there wasn’t a whole lot of kids and I was a kid myself. So I connected alot with kids and didn’t focus on families or volunteers as I grew and the amount of kids coming increased I started to realize that I could not keep doing things the same way I had. Being in one place long enough to see the kids you had in preschool graduate and walk away from their faith has a very profound effect on you. In the past year I have begun the journey of trying to figure out how I can not only minister to kids on the weekend but put more effort into intentionally teaching/training/equipping parents to be a part of their kids spiritual life. I think think in children’s ministry we create a problem long term with the children’s pastor model. We like it as pastors because we are the hero, parents like it because it absolves them of some responsibility. The kids are the ones who pay the price in my eyes. We do alter calls in kids ministry and so often the parents have no idea what took place and how to use that as a building block in their kids lives. Think about it soccer, karate and t-ball provide a greater demand for parental involvement than we do in kids ministry. What are we doing to actively engage parents? Kids need, a pastor a small group leader another voice they also need parents who can answer tough questions and who are involved in the key spiritual moments in a kids life. I would agree that we are saying mostly the same thing…perhaps a tomato, tomato type of thing. However, I would love to see research out there that can prove the effectiveness of a family pastor. I know there’s something out there so if anyone can direct me, please do. All those things you mentioned above are things that I (and my team) are doing as a kids pastor. I’m still convinced it’s not about the position or title, but in the culture of the church. If not, then a family pastor serves only ad someone who keeps directors/pastors flowing in the same direction (so families can connect later about the same topics). I’m still a little perplexed on the point of having a youth pastor or kids pastor if we have a family pastor (ok, I’m playing a little dumb for the sake of conversation). Why don’t we go back to doing church as they did a half century ago before their were kid and youth pastors? It wasn’t until we added all these positions that we drifted so far from center. LOVE this post – and as the comments reflect, there is no easy answer. I will say, I agree with you for myself, I will always be a children’s pastor who works to connect families to the church and partner with parents. (thanks Glen for the mention of my lab above which explains my strategy in great detail so I won’t “sell” here) My reason is a little different – it is KID FOC– USED, for me the title DOES MATTER, because I want the kids to have a pastor FOR THEM. I want the children to know THEY HAVE A PASTOR who is there for them. The adults don’t need a title, they respond to what I DO for them, how I serve them, regardless of my title, they focus on ministry results. I could be the janitor, if I HELP them, they will respond and be blessed and respond. But I want the kids to come to church and say, “Wow, they have a pastor for ME?” THAT is why I am and always will be a Children’s Pastor, regardless of what I do for and through and with families. So I agree with everyone here… but will always be a Children’s Pastor in title, for the kids sake. (I think I just wrote a blog post! Title to copy and paste this!) 😉 Thanks for the inspiration! And a great children’s pastor you are. I don’t think it’s one specific person who connects families. I think it’s a church culture thing. Every pastor on staff beginning with the lead pastor has to be willing to think of families and make it important. Me? I want to do my part by helping parents connect with their kids and kids with their parents, but at the end of the day I am a proud kids pastor! 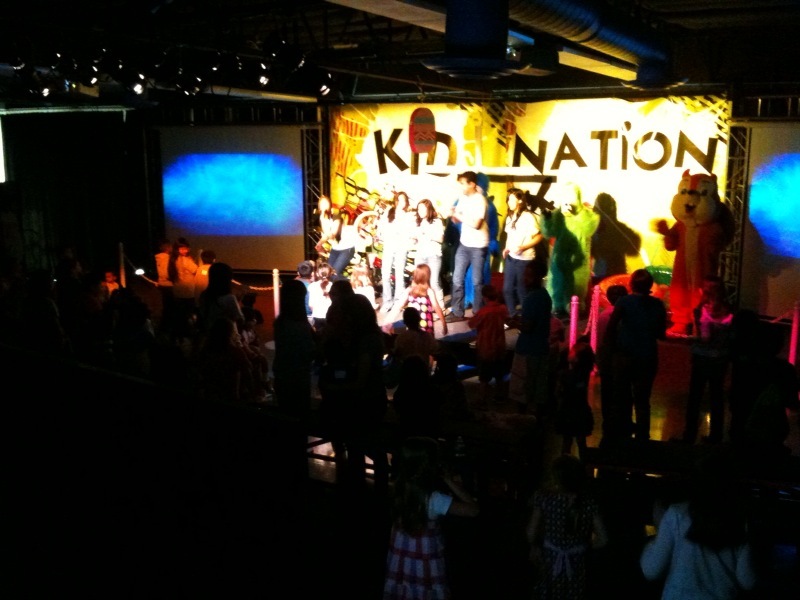 Love what you bring to kids ministry! What a great conversation! Justyn, I really appreciate your thoughts. I like how you described being a children’s pastor who also connects well with families. Best of both worlds. I too, feel for the kids whose parents just don’t get it yet that they are the spiritual leaders. We have to stand in the gap as much as we can while those parents have a chance to grown. What I love about the local church is that each one is different and each one has different needs. I love that there is no one “right” way to do ministry or for a staff to be organized. Sam, my first group of kiddos at my church are now seniors in high school and it will certainly be a prayerful challenge to see what the next few years hold for them. Michael, I can definitely see the benefits to a position like yours as our church grows. I imagine that your position helps break down some the “silos” that can occur as well as try to make transitions from one age group to the next much more smooth. Justyn, thanks for your comments and your thoughtful responses. We’re organizing a blog tour for Sojourn Community Church’s first children’s book. It’s a storybook that teaches the value of families having worship at together at home. This book puts the idea of families being on the spiritual front-lines in a format that can break through to help those families. I just wanted to give you a heads up and invite you to participate. Here is the post with the details and sign up. thanks so much for your insight, transparency and vulnerability. I too am a proud-to-be children’s pastor who wouldn’t trade it for the world. I think the key will always to be connecting families… no matter the age or the place they are at in their spiritual journey. Regardless of your title… it is the call that God has placed on you – coupled with the ability to be relational… will result in ministry to the entire family by virtue of the fact that YOU’re there for THEM. I will continue to read the books and follow the blogs and even attend a few seminars or conferences in which the “Family Ministry” concept is the feature… But Children’s Pastor is my calling and I reach and keep all ages. Agreed. love your second paragraph. And, absolutely still going to be reading “family ministry” books. This is one children’s pastor who loves families! This post really frustrates me. Not because it makes me mad, because I can’t really decide which side I want to be on. I lean more towards what You, Jamie, and Karl are saying, but I totally see the value in being a family pastor in title. After working through it, though, I think I am finding my footing. A couple of weeks ago my pastor said to me, “maybe we should change your title to family pastor, because you minister to more than just the kids, you are ministering to their families.” For me, that is exactly how it should be. I am a children’s pastor, but I understand in order to be the best CP I can, I have to minister to the family. I’m still working through some of these thoughts. Someday, maybe, I may change sides. But for now, I’m a children’s pastor. That’s the beauty of kids and family ministry. No one has to take sides. I am a kids pastor who also ministers to the family. I have to–that’s part of being a successful kids pastor. When it comes down to it I am who I am and I do what I do because this is what I feel called to be and do. If God is calling someone to be a family pastor then do it. If He’s calling you to be a kids pastor then do that. I’m not against family ministry. I’m for and support it and to be honest my team and I resource and minister to families with the best of them. I feel that to have one person be a “family pastor” seems odd. I think it’s a church culture–not just a position. I think the Children’s, Youth, Executive, Lead, Missions Pastors are all part of the family experience not just one person. It’s a collaborative effort from all pastors on the team. I couldn’t hold my post any longer. As a seminary student with the goal of Children’s Pastor (yes, CHILDREN and not Family), we are being taught “Family Ministry” through and through. I tend to agree with keeping the CHILDREN”s Pastor title because, as Karl stated, it lets the kids know we are there for them. That being said, in my opininon every last poster has agreed that they are in and doing family ministry. To me, Family Ministry is not a title (like Children’s Pastor) that tells who you are, but it is a more mindset and way of leading our ministry and our people and it lets others know what you do. The whole concept is to get away from fragmenting the family and serving them as a unit. It is important to serve the different age demographics because, lets face it, there are just some things you can talk about with 16 year olds that you can’t talk about with 6 year olds (i know drastic comparison, but it makes my point) but in today’s society the family has very little time together. In addition, parents today have not been properly mentored themselves so how can we expect them to mentor their own children? Parents today are products of the drop-off and baby sit my kid mentality. how many of you babysit? Let’s face it. By and large, many parents are clueless to what their role is supposed to be (at least the parents I work with). The think they are doing their part by bring the kids to church. Maybe, they do some devotional type Bible reading at home or have God-based discussions here and there. As Children’s Pastors, we need to be doing all we can to disciple the children in any way we can, and this includes educating, resourcing, and discipling their parents. Therefor, we must engage in family ministry. Sorry about my rant. I think we all are saying basically the same thing. Great post! By chance, what seminary are you attending that is focusing more on “family ministry”? (nice new blog look, by the way) I have been enjoying this conversation. I think you nailed it – “I think it’s a church culture–not just a position. I think the Children’s, Youth, Executive, Lead, Missions Pastors are all part of the family experience not just one person. It’s a collaborative effort from all pastors on the team.” If you give ONE PERSON the title of “Family Pastor” aren’t you, in effect, telling the others, “I got the families, guys, you can focus on your stuff.” Just something to consider. I think the Senior/Lead pastor needs to LEAD for the families and EVERY staff position (except maybe Worship*) needs to be engaged in the arena of family ministry. But I agree with those above who said, its a church decision – I’m not against or criticizing anyone who has the “Family Pastor” title, it does communicate a priority of family in a church, and show that family is so important you’ve dedicated a pastoral position to focus on it, but for me – as I said above, I want the kids to know, there is a pastor for them, but I must work with the families to accomplish my bigger goals for them. Interesting conversation from all sides – it is amazing how over the past 10 or so years the whole ministry has been turned on it’s ear by two little words, “Family Ministry”. I, too, struggle with what camp I am in but when it come down to it we all minister to children and last time I look children come from families, no matter what they look like, and you really can’t minister to one if you don’t minister to the other, no matter what you call yourself.